I spent a little of my time last week finishing off a few projects for my Etsy shop and one for myself. 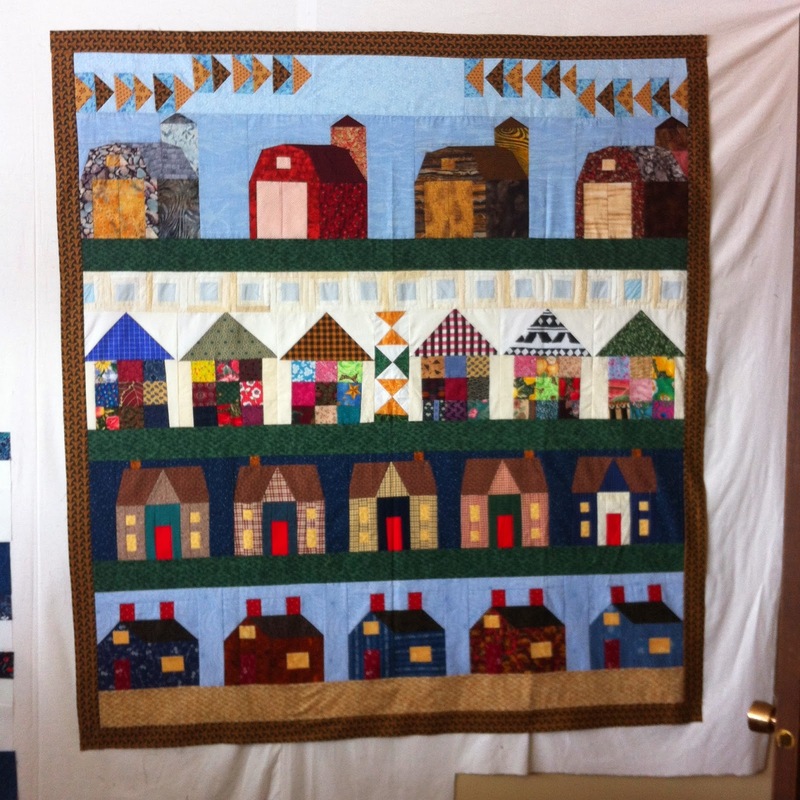 This row by row quilt was started the year before we moved here in about 2001. 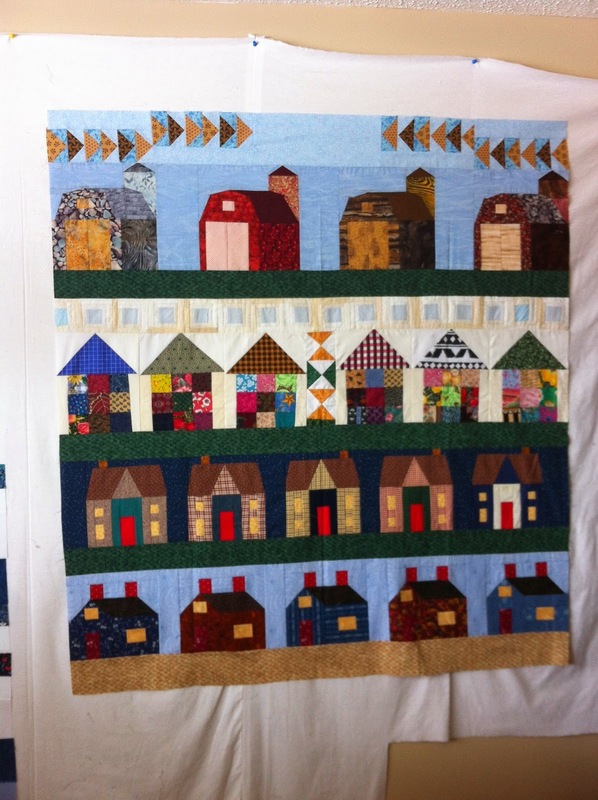 The idea of a row by row quilt is for each person to start a quilt with a row of blocks - my row is the double chimney houses at the bottom. Then the quilt is passed to another person, who adds their row and so on until everyone in the group has added a row to each quilt. For some reason, our row by row quilts stalled somewhere along the way and I finally got mine back from my friends a couple years ago! 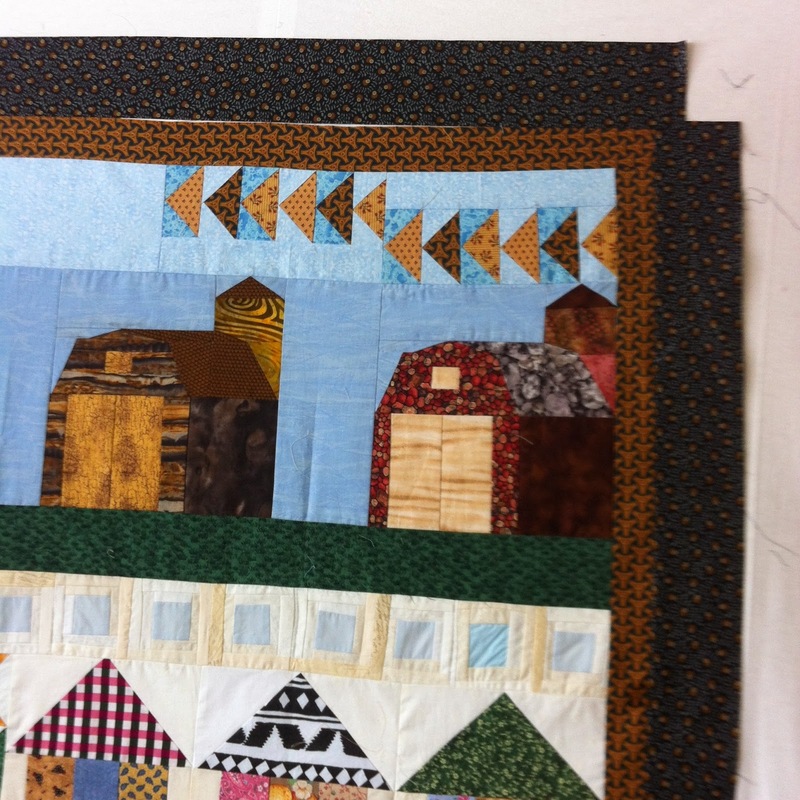 I loved the scrappy houses and barns, but the quilt was wider than long and so I decided to add a little border of tan fabric at the bottom and some flying geese blocks to the top. A narrow border of tan & navy fabric fences in the houses nicely. And a final wider border of navy. Sometimes poor planning (like cutting my border strips too short) means a different element can be added - and no one will know it wasn't planned. Unplanned 9-patch corner blocks to fix cutting error! So, the final border has little 9-patch blocks in the corners! Perfectly sized to fit on my quilt hanger in my dining room! This still needs to be quilted, but I'm content to hang it as is for now to enjoy. I think of the good times I've had with the women who added their creative juices to this quilt and smile as I sip my tea and look at my new wall hanging! Have you worked on a group project? What was your fav part of the process? Great project and so well executed!! It's eye candy in your dining room! 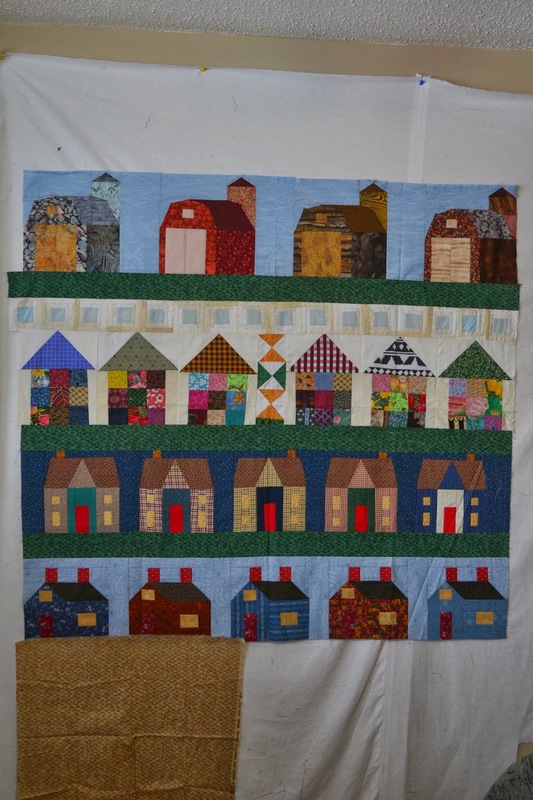 This is a delightful row quilt ... Great memories ... and I love the little corner blocks!! Cute project! I love doing group projects and haven't done one in so long. The houses and building are great! Love the colours! You did a great job on this quilt! 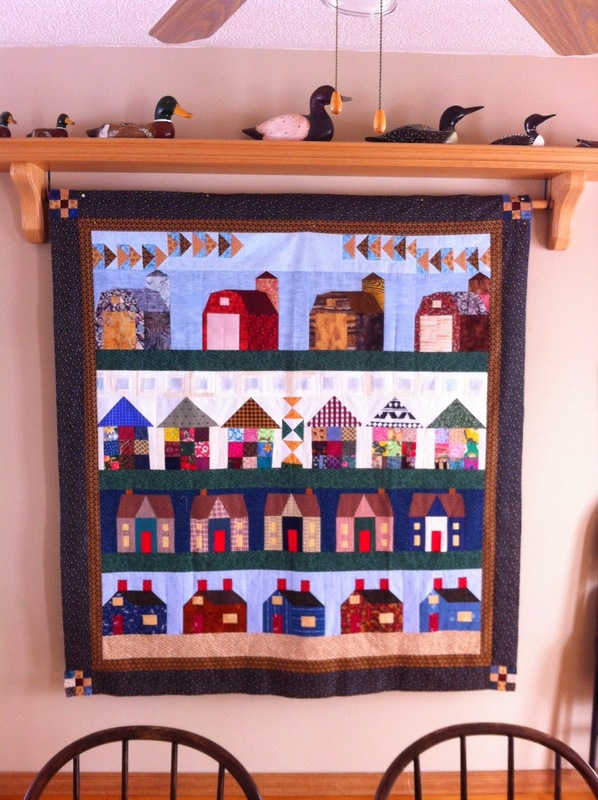 Absolutely lovely, you are so lucky to have friends who quilt! And the corners are a perfect addition.